AJMAN, UAE - July 10, 2016 - PRLog -- The sale took place in collaboration with Gulf Craft's exclusive Australian distributor, Australian Superyachts, acting for the buyer, and the superyacht is due for final delivery in August 2016. The 37.5-metre superyacht is powered by twin Caterpillar C32 engines, and complies with RINA Commercial Yacht Charter Class and Cayman Islands MCA LY3 standards. Since the yacht was built specifically for the Australian charter market, it also adheres to Australian Maritime Safety Authority (AMSA) Class 2C, 1E and 1D Commercial Vessel Survey regulations. With stunning exterior and interior styling courtesy the Gulf Craft Design Studio, the Majesty 122(M/Y Ghost II) offers luxurious accommodation for up to 12 guests across five en suite staterooms, features a jet black gel coat hull, and will be delivered with a metallic silver superstructure.. The superyacht will be based in Sydney and offered for charter on the East Coast of Australia. Gulf Craft CEO, Erwin Bamps, said, "With commodious interiors, state-of-the-art technology, and panoramic windows offering breathtaking views of gliding seascapes, the Majesty 122 is essentially a floating resort that promises passengers a memorable journey. The superyacht combines powerful engineering with contemporary design, allowing holidaymakers to take the home-away-from-home experience to the world's most exotic cruising destinations." Australian Superyachts' Managing Director, Richard Morris, added, "The Majesty 122 is ideally suited to the Australian market, offering versatility for coastal cruising and South Pacific adventures. Its spacious layout makes it perfect for extended private cruising for family and friends, and it is also optimised for short corporate cruises with more than 100 guests. We are confident that the Majesty 122 will receive a warm welcome on the Australian charter market." 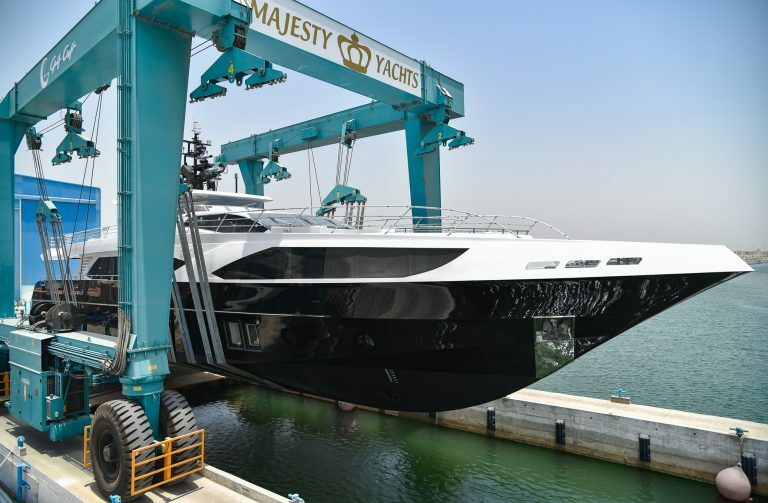 Since its global launch in March 2015, the Majesty 122 has shown an early start to success. Having won the prestigious Best Asian Built Yacht award at the Asia Pacific Boating Awards, the Best Yacht Installation award at the 2015 CEDIA Awards, and the Quality and Value Award at the 2016 World Superyacht Awards, the Majesty 122 is testament to Gulf Craft's ongoing commitment to delivering world-class craft. The Majesty 122 (M/Y Ghost II) http://www.majesty-yachts.com has unrivalled lounging areas for entertaining, including two decks with lavish interiors, an extended balcony and a spacious fly-bridge. The superyacht also offers a fully equipped galley, and a garage able to house a Castoldi 16-foot tender and a jet ski. Established in 1999, Sydney-based Australian Superyachts offers a complete range of services to the Australian superyacht sector including Gulf Craft sales, charter central agency, superyacht management, technical project management, crew placement and yacht agency.